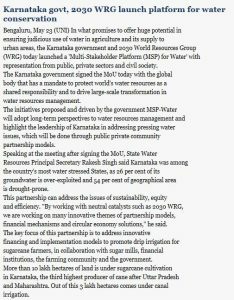 Bengaluru, May 23 (UNI) In what promises to offer huge potential in ensuring judicious use of water in agriculture and its supply to urban areas, the Karnataka government and 2030 World Resources Group (WRG) today launched a ‘Multi-Stakeholder Platform (MSP) for Water’ with representation from public, private sectors and civil society. The Karnataka government signed the MoU today with the global body that has a mandate to protect world’s water resources as a shared responsibility and to drive large-scale transformation in water resources management. The initiatives proposed and driven by the government MSP-Water will adopt long-term perspectives to water resources management and highlight the leadership of Karnataka in addressing pressing water issues, which will be done through public private community partnership models. Speaking at the meeting after signing the MoU, State Water Resources Principal Secretary Rakesh Singh said Karnataka was among the country’s most water stressed States, as 26 per cent of its groundwater is over-exploited and 54 per cent of geographical area is drought-prone. This partnership can address the issues of sustainability, equity and efficiency. ”By working with neutral catalysts such as 2030 WRG, we are working on many innovative themes of partnership models, financial mechanisms and circular economy solutions,” he said. The key focus of this partnership is to address innovative financing and implementation models to promote drip irrigation for sugarcane farmers, in collaboration with sugar mills, financial institutions, the farming community and the government. More than 10 lakh hectares of land is under sugarcane cultivation in Karnataka, the third highest producer of cane after Uttar Pradesh and Maharashtra. Out of this 3 lakh hectares comes under canal irrigation. The MoU also envisages market linkages between the farming community and agri-business companies to promote water-efficient cultivation practices along a Drip-to-Market Agro Corridor (DMAC, including Ramthal MIS project in Karnataka. It also focuses on reuse of treated urban wastewater, through a policy framework and the establishment of a Resource centre.